After our last article, Coaching While You Sleep…and Getting Paid for It, I know you’re feeling pumped about extending your product range by creating your own coaching products and selling them online. Right?! Since every online empire has to start somewhere, this article covers three tried and tested entry level products that every modern coach can and should be offering. Conveniently, they can all be sold online! 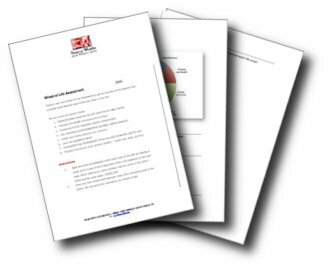 Your Free Worksheet is the foundational piece in your new product range. It will be something that you give away for free on your website (well, I say ‘free’ but really it’s in exchange for a person’s name and email address). Your free worksheet is the intro and the clincher that gets people interested in what you do. I’m going to guess that there is one topic that you especially LOVE coaching people on. Well, that’s where you start. Once you’ve chosen a topic that you are passionate about, come up with a series of your best 7-10 coaching questions on that topic. Create a simple, 1-3 page worksheet that includes your branding and your questions. Give it a catchy title, save it as a PDF and voilà! You now have a freebie you can use to grow your network of prospects. 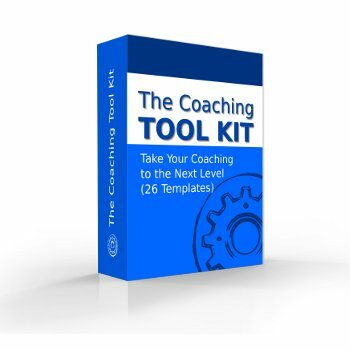 A super easy, must have for any coach. Your first Tool Kit is a little pack of worksheets that follows on from your Free Worksheet. Your Tool Kit will be an entry point for a lot of your new clients so, it should cost somewhere between $10.00 and $30.00. This price point lets people try you out with little risk (note: as you get a following of buyers, you can start to introduce more expensive products). Get out a pen and paper. Write the topic you are passionate about in the middle of the page. Draw a circle around it. Somewhere near your main topic, write down the title of your Free Worksheet. Put a circle around that and then draw a line connecting the topic and the worksheet title. You have the beginnings of a mind-map of your topic – a great tool for firing up your creative juices! Now, fill the page with all the other ideas that come to you on your topic. Draw a circle around each different idea and connect each circle to to other circles using lines. This will help you see how your ideas relate to one another. Anything goes. Seemingly stupid ideas and seemingly clever ideas all have massive value. Be creative and have fun with it! Eventually you will start to notice patterns of ideas that will help you decide how many worksheets you need to have in your Tool Kit as well as the essential concepts. Once you know what you need in your kit you are ready to make your worksheets. Create simple, worksheets that include your branding and your content. Once you’ve finished each worksheet, save each one as a well named PDF and compress the pack into a single .zip file. Give the Kit a catchy name and voilà! This is a set of 3 or more videos that act as a value add for people who’ve invested in and loved your Tool Kit. Each video should build upon the content of your kit and should be between 3 and 15 minutes each. The series is sold as a set and costs the same or slightly more than your Tool Kit. The easiest way to attack this project is to record yourself talking about each of your worksheets. One video per worksheet. By now you are becoming a real thought leader on your topic. Your persistence in creating your entry level products has helped you start to crystallize your thoughts. Your confidence is growing and your focus on your topic has helped you start to see new ideas, themes and processes that you overlooked in the past. Now, you are ready to take everything to a new more sophisticated level. Sophisticated products start to bundle ideas into eBooks, Coaching Programs and Mastermind Groups. One-on-one coaching then becomes exclusive and highly valued. The most important thing is to make your first product, the Free Worksheet, as soon as possible. It should take you no more than 16 hours and will be an asset that you can use in your business forever! Plus, it will show you that you CAN produce something that helps people that IS NOT your time one-on-one coaching – unlocking massive future income potential. You’ll get a taste of the process and may even get addicted. Just wanted to let you know how wonderfully helpful this blog post is! It has come to me at just the right time, as I am in the process of creating offerings and products that will serve as another income stream. Thank you so much for sharing these tips! Another fabulous, pragmatic post from Benay. It’s like you can read my mind! I LOVE that you detail the process and order of these different levels should go in. Time to get started! I was sort of pulling together a video series on digital marketing, but those pesky negative voices in my head made me think it was a silly idea. Now, I’m going full steam ahead and will incorporate these video tutorials into my content more. James – You made my day. Happy my article hit its mark! Ann – Thanks for sharing your link – you are totally on to something! Video content is so porwerful. We should all be doing more of it – myself included. People like to connect with people and video makes you come alive more than any other online medium can. Tammi – Awesome feedback. I now know I’ve done my job. Thank you! All – I’m super excited about seeing what you guys come up with. Please be sure to post it on our FB page (link below) when your products are ready. You will inspire other coaches to get going too! What a gift! Thank you for this valuable information. I believe your compensation, for sharing, will bless your life and all you put your hand to. Thank you so much for this information. It’s priceless! Love your clarity and your ideas! Sometimes things seem so hard to do, but you only need a clear and nicely ordered list of steps to follow to get you unstuck. Thank you for your posts! Thank you Benay for sharing these valuable insights and so timely!